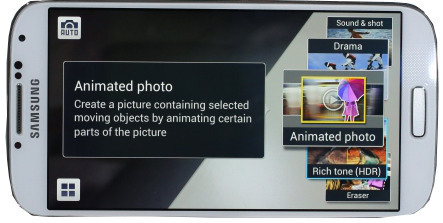 Animated Photo in your Galaxy S4 can turn your short video into animated GIFs. The reason of using an animated GIF instead of a video sometimes is the file size. In addition when you put a video in a webpage, quite often some users cannot play it. But an animated GIF does not suffer from this issue because most browsers support it out of box. It is a bit tricky to use this feature. First, you need in the Animated photo mode (in the Camera app) to get this feature. It is impossible to convert existing video to animated photo. Once in Animated photo shot mode, if you keep your camera steady, the tool will suggest areas to animate. This usually is correct and you do not need to do anything. Of course, it is possible to manually draw any area to be animated. Other areas should be relatively static. Or highlight area to be still, and other areas will be animated. You can also trim the video, and decide the beginning and end frames after it is taken. Once the photo is saved, you will only get the animated GIF. The original video is apparently not saved. The length of the video is limited to 9 seconds. The good thing is that this GIF can be opened in almost all devices. To access Animated photo, you need start the Camera app, the select the shooting mode to Animated photo. Q1 : A brush-shaped icon appears in the photo. A : It indicates that the file is a GIF file taken in Animation mode. Q2: Can I transfer the GIF file in ChatON after taking picture with the Animated photo feature? A : Yes, If you want to transfer via ChatON, please transfer via ChatON menu from ‘Share via’ in gallery. To view the picture, please check the photo in the gallery app after saving the transmitted photo in device. Also, you can transfer the animated photo via Email, Bluetooth, NFC, Wi-Fi Direct etc as well as ChatON. Q3 : When I run a slideshow using images that include ones taken in “Animated Photo’ mode, the Animated Photo doesn’t “animate”. What should I do? A : When viewed using via gallery, the animated photo shows the movements of the original saved image. But in the slideshow, the static thumbnail photo will be shown and so without movement although the source picture is an Animated Photo. It’s a concept of GalaxyS4 and normal. I need this for s3! any good apps for this? It is rumored Samsung will bring most of those features to S3 and Note 2 through the 4.2 update.